Atomic clocks are the gold standard of timekeeping. 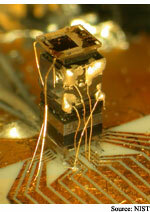 They are thousands of times more precise than the quartz crystal oscillators found in wristwatches and cellphones. Researchers at the National Institute of Standards and Technology, keepers of official U.S. time, have developed a tiny atomic clock that promises to keep handheld devices in sync. Quantum mathematics has yielded a better understanding of the acoustics of speech. In examining how speech works, a team of researchers has found that a relatively small number of changes to the shape of the vocal tract produce virtually all of the vowel sounds used in language. They are aiming to apply this knowledge to telecommunications, speech recognition and speech synthesis. Teaching search engines to see Web pages the way people do could improve their performance. Analyzing links based on content-specific blocks of text rather than whole pages promises to boost search result relevancy. Microfluidic systems hold the promise of shrinking chemistry labs to the size of computer chips, which would enable handheld biological and chemical diagnostic devices. A method of carrying out logic operations that employs fluids rather than electricity could lead to labs-on-a-chip that don't need electronic control circuits. Chip spots DNA electrochemically... Crystal structure tunes nanowires... Gas flow makes electricity... Sound makes electricity for space... Design rules build on self-assembly... Nanotube diode reverses itself.